PrintPlace is a good online print-on-demand service. They don’t have any alternative design options (like premade templates or an interactive design tool), but are able to take your uploaded designs and print them professionally. PrintPlace has a number of custom print products to choose from, and deliver excellent quality prints. Overall, PrintPlace isn’t bad at all, they just aren’t the best. Currently, on our 3rd place. After careful considerations of significant points in this study, PrintPlace is still considered as one of the topmost trusted companies when it comes to online printing. 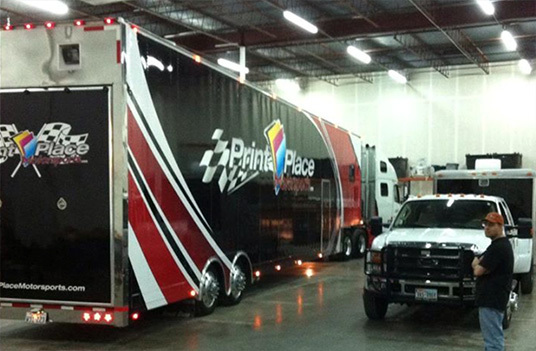 What makes PrintPlace one of the best printing sites? Print quality. Almost all six products we ordered feature incredible quality, as well as fair value. PrintPlace does make users pay before designing, which is one major annoyance. As a graphic designer, it’s important to me to have an affordable yet quality choice for myself and my client’s printing needs. After trying out some of the local printers, I decided to try out PrintPlace since I wasn’t really too impressed by what I was getting for the price from other places. First, I received a sample packet which impressed me. I was a little intimidated placing my order before knowing how the process of uploading the artwork would be; but once I got in there, I was very happy I made the choice. I’ve used their Live Chat before too to correct a problem with my order and they were more than willing to help out. Great customer service. The quality of the paper is very nice and the ink is vibrant. The printing is exact and uploading the proof to their website is so simple. Everything is received on time and all of my clients are happy with the result. I have used PrintPlace since 2008 and I haven’t used anyone else since. Give them a try! Or at least request a free sample packet. By the way, the sample packet really comes in handy when deciding what type of paper, coating & size to order. I keep it with me when I meet with clients who are interested in print services. I’ve been using them since 2007 to produce color glossy brochures and booklets – probably a dozen or so orders in the 2000 – 10000 item range. The results have been uniformly good, with printing and shipping on time. On a couple of occasions they have found issues with the proofs and called me immediately. PrintPlace is a good choice for people who have already created design for their business cards. The main advantage of PrintPlace is that they offer quality cards at a lower than average cost. However, they are print-only service and do not provide you with design templates or tools to help you create a business card from scratch, which are offered by many other services we’ve reviewed. PrintPlace meets all of our standards for a business cards printing service and also offer special card options, such as rounded corners, special cutouts/shapes and foldover cards. The best thing about the services offered by PrintPlace is that the site itself can be your one-stop shop for all your printing needs. Aside from online printing, you can also take advantage of the in-house mailing services that they offer. You can take your pick from the fast turnaround options that they have and the wide array of printed products that they offer. Finally, when it comes to price, the rates offered by PrintPlace.com is at par with the rates quoted by their direct competitors – so you will definitely get your money’s worth when you take advantage of the services offered by PrintPlace.com. When it comes to online printing, it really is the place to be! Thanks to automated ordering system, PrintPlace combined production and shipping time and cost making the ordering process easier. They also pride themselves with a reprint/refund guaranty so in case there&apos;s something wrong about your prints, rest assured they&apos;ll do something about it. Other Products Offered: Bookmarks, Calendars, Door Hangers, Envelopes, Greeting Cards, Hang Tags, Labels, Menus, Newsletters, Note Pads, Posters, Rack Cards, and Table Tents. Other Services Offered: Mailing Services, Affiliate Programs, and File Repair Service.